“Medical service fees” refers to the fees that healthcare providers charge for medical services and pharmaceuticals covered by health insurance plans. These fees are set through a medical service fee point system in which 1 point equals 10 yen. All healthcare providers throughout Japan are required to comply with the medical service fee points and calculation requirements for health services, medical devices, and pharmaceuticals that are set by the MHLW, and providers are prohibited from charging medical fees in excess of these set amounts. In general, providers may not provide patients with combinations of insurance-covered and non-covered treatments (mixed medical treatments); however, mixed medical treatments are allowed for situations covered by the Special or Specified Medical Care Coverage System. The Special or Specified Medical Care Coverage System applies to situations involving advanced treatments and Patient-Proposed Health Services (PPHS) that are under evaluation for insurance coverage as well as elective treatments not intended for coverage. ＜Column＞Has episode-based payment resulted in lower costs? The medical service fee system includes a Fee-For-Service (FFS) system and a Diagnosis Procedure Combination (DPC) payment system. Since the foundations of the current health insurance system were established in 1961, medical service fees have come to be based on a Fee-For-Service (FFS) system. The medical service fee system reimburses providers from insurance funds based on medical service fee points, calculated by each medical facility according to the insurance-applicable medical services, pharmaceuticals, and medical devices actually provided. The Diagnosis Procedure Combination (DPC) payment system is a medical service fee framework unique to Japan that emerged in the early 2000’s amidst growing concerns over healthcare costs, lengths of hospitalization, and the healthcare demands associated with the rapid aging of the population. From 1998 to 2004, an episode-based payment system for acute inpatient care was introduced on a trial basis at 10 major hospitals. During this trial period, the current DPC framework using a per-diem payment system (PDPS) was introduced. Among other things, the trial revealed that, regardless of large variations in length of hospitalization among patients with the same disease, compared to fee evaluation based on a retrospective, per-hospitalization method, fee evaluation based on a prospective, per-diem method resulted in smaller gaps between the total service fee points and the actual resource costs and provided an incentive to lower per-diem costs. The main purpose of the DPC system is to promote the standardization and transparency of healthcare. This system aims to improve the overall quality of healthcare while also addressing disparities among hospitals through the construction of an objective medical treatment information database that can be used to clarify medical outcomes and improvements. At the same time, the objective data of the DPC system gives patients the benefit of being able to reference standard treatments and pricing information. In addition, the DPC system is expected to contribute to shortening the average length of hospitalizations. As of April 1, 2016, approximately 55% of Japan’s general hospital beds (490,000 beds in 1,667 hospitals) were covered by the DPC system. Similar to the diagnosis-related groups/prospective payment system (DRG/PPS) introduced in the United States, the DPC system uses codes based primarily on combinations of diagnoses and procedures. There were a total of 4,244 such DPC codes as of April 2016. The Japanese system is unique in that it includes per-diem, bundled/ episode-based codes that are partially integrated with a fee-for-service (FFS) system. Medical fees for inpatient treatments that correspond to DPC diagnostic groups are calculated using a flat-rate, prospective payment system, while fees for non-corresponding services are calculated using an FFS system. Basic hospitalizations, screenings (including diagnostic imaging), injections, medications, and procedures valued at less than 1,000 points are subject to bundled/episode-based evaluations. Fees for these treatments and services are calculated based on a combination of DPC code-specific per-diem points, lengths of hospitalization, and medical facility coefficients. Surgeries, radiation therapy, anesthesia, and treatments valued at 1,000 points or more are not subject to bundled/episode-based evaluations. Fees for these treatments and services are calculated using a Fee-For-Service (FFS) system. In order to eliminate variations in the set coefficients assigned to medical facilities offering similar levels of care, the government reconsidered facility type-specific coefficients. Facility coefficients now include the Basic Coefficient, Function Evaluation Coefficient I, Function Evaluation Coefficient II, and the Provisional Adjustment Coefficient. In the past, there were just three types of facility-specific coefficients—the Adjustment Coefficient and the Function Evaluation Coefficients (I and II), but after the FY2012 revision to the medical fee calculation system introduced the Basic Coefficient, the Adjustment Coefficient began to be gradually replaced by the Basic Coefficient and Function Evaluation Coefficient II. In the FY2018 revision, the Adjustment Coefficient will be eliminated. Basic Coefficient: Used for basic facility services that cannot be evaluated using Function Evaluation Coefficients. Function Evaluation Coefficient I: Used when considering the entirety of the medical facility as a service provider, including its personnel organization, facilities, and structure (structural factors). Function Evaluation Coefficient II: Used when considering incentives (for roles/ functions that medical facilities should take on) to improve medical delivery system efficiency through the use of DPC/PDPS. Fee calculation methods also vary according to the stage of hospitalization of which there are three. The flat, per-diem fee during Stage I, the earliest stage of hospitalization, is set higher than for Stages II and III. Stage II includes days spent in the hospital past Stage I through the day representing the national average length of stay according to DPC data. Although flat fees within this stage vary according to each diagnostic category, after taking into account the average per-diem medical resources used, fees in this stage are effectively lower than fees in Stage I. In Stage III, the final stage specified within the DPC system, per-diem rates are set even lower than in Stage II. In exceptional cases, when hospitalizations extend beyond the end of Stage III, all additional medical service fees are then calculated using the fee-for-service (FFS) system. There is much debate within Japan on whether the DPC system is producing results in line with its original purpose. The DPC was created through a unique combination of the United States’ PPS and FFS systems. There have been many analyses published concluding that the use of this system cannot be linked to cost reductions as well as many publications arguing that the PPS system needs to be applied to an even greater range of services. Japan’s medical service fee system is currently revised once every two years. When under revision, discussions are held in a variety of domains. 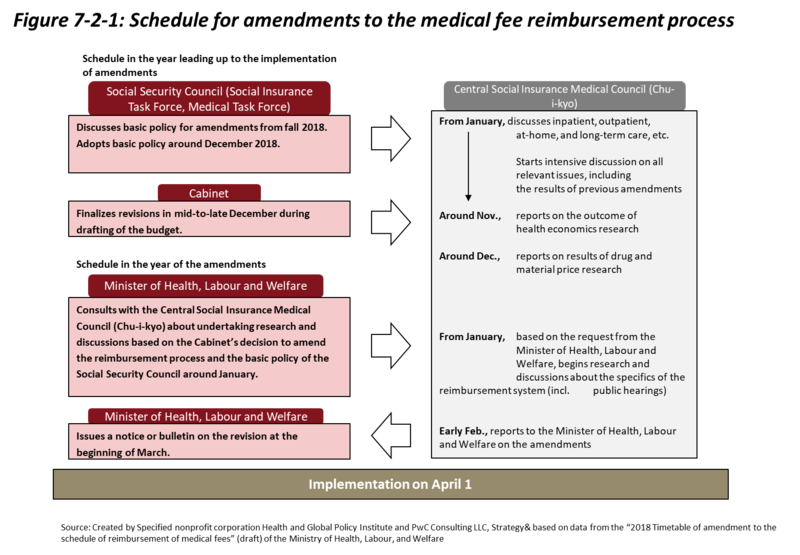 As shown in Figure 7-2-1, over the course of the revision process, the Social Security Council, the Cabinet, the Minister of Health, Labour and Welfare, and the Central Social Insurance Medical Council (Chu-i-kyo) hold discussions and set goals. For instance, the Chu-i-kyo not only makes proposals over the course of this process, it also holds discussions and responds to inquiries from the Minister of Health, Labour and Welfare regarding medical service fees, regulations for medical facilities, and health professionals authorized to accept insurance. The Chu-i-kyo is composed of both members representing insurers, the insured, and employers (on the payer side), as well as members representing doctors, dentists, and pharmacists (on the medical side), and others representing the public interest.